Nightrider(N): A Rider along a straight line on squares lying a Knight`s move away from each other. Andernach Grasshopper(AG): A Grasshopper that changes the color of any non-royal hurdle it leaps over. I. 1… Be3 2.AG-a2 (wP) b4 3.AG-a5 (wQ) b5≠! II. 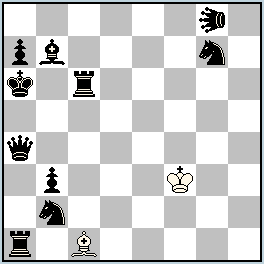 1… Bd2 2.AG-g6 (wS) Se8! 3.AG-b6 (wR) Sc7≠! Delightful N-bristol ! The mates show a nice echo too! 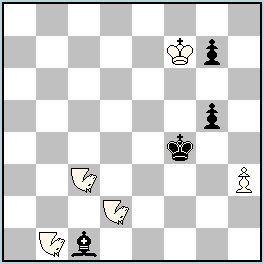 AG effects in 275 are very nice, especially the last black moves where the AG transform bQ and bR to make selfpins to avoid later colour transformation of the mating pieces and also to protect squares. A believe that the interesting fairy piece Andernach Grasshopper will become more popular – I have received so many nice problems with it for Alaikov 80 MT 2013. The pin mates in 275 are indeed nice. Unfortunately, the motive for selfpin is not pure.